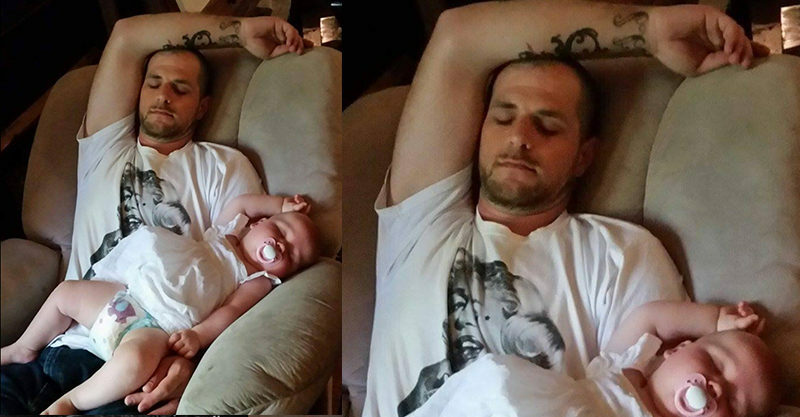 This dad and baby girl may not have spent as much time together as they would have hoped, but that doesn’t stop them twinning in perfect style, even as they sleep. The adorable baby’s mum, Jade Webster, shared these images with the Love What Matters Facebook page, along with the story behind the pics. She explained this dad and daughter have been living in different countries for quite some time. They didn’t let distance stop them connecting in various ways though, forming a close bond via video calls (Skype or FaceTime, perhaps). Cutely, it’s become apparent that some uncanny similarities have arisen, despite the thousands of kilometres separating the pair. “I wanted to share the bond between my daughter and her daddy. At the moment we live in different countries and prior to these pictures they had only ever seen each other through video calls; the love in her eyes when she looks at him just shines out. She shares his mannerisms and even sleeps the same as he does lol. The duo pair perfectly illustrate that love trumps the challenges of separation, often in copycat style! While some might put the similarities purely down to genes, we’re betting that there are plenty of non-blood related kids and loved ones that share twinning mannerisms and language. Step-parents and kids with copy-cat habits? Mum’s bestie and baby do-a-likes? Godparent and kiddo twins? Or maybe your child is a chip-off-the-old blood relative? Mimicking the things they do or say in grand style? We’d love to hear about it. Perhaps you’ve got a photo of your kiddo twinning with someone they love? Feel free to pop over to the Babyology Facebook page and share it on this post. What do you think? Is this down to love or genes? Or a bit of both?